It eternally amazes us that Mother Nature can provide us with the best, most phenomenal raw materials for our cosmetic lives. Like with bamboo exfoliant. 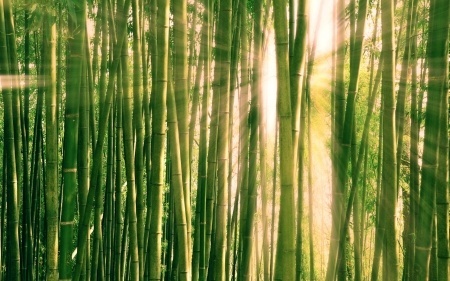 Bamboo exfoliant is made from the sap of the giant bamboo. When that sap crystallizes into a powder, it becomes a natural microdermabrasion! Microdermabrasion has grown into a wildly popular beauty trend. It offers the promise of minimized pores, a radiant glowing complexion, improved skin tone and strength, and faded wrinkles and scars. The term technically refers to a non-surgical cosmetic treatment, but in a general sense, also describes any application of tiny rough grains that buff away the skin’s surface layer. The focus here is on the word tiny. The difference between a microdermabrasion treatment and a regular exfoliation has to do with the size of the granules. The smaller the granules applied to the face, the finer the results. Bamboo exfoliant particles measure less than 160 microns across- so just imagine how those tiny buffers scrub off the top layer of skin for glossy, strong, refined beauty! Bamboo exfoliant effectively clarifies impurities, oil, makeup and dead skin cells from the pores and leaves the skin fresh and pure. It resurfaces the epidermal layer to reduce the appearance of fine lines, wrinkles, age spots, and acne scars. Bamboo Exfoliant is gentler and milder than apricot pits or walnut shells (often used in natural exfoliating products) making it a superb option for sensitive skin. Lastly, Bamboo also unquestionably regenerates elasticity and collagen production for youthful strength and fullness. The secret here is the way in which plant based products function with the skin. Plant-based cosmetics heal the skin in a kind-of homeopathic manner. The cellular intelligence held in plant DNA (often millions and millions of years old) “educates” human cells when applied topically. There is a kind of resonance that occurs. The vibration of the skin cell syncs up with the vibration of the plant product, and which leads to healing based on that new resonance. Bamboo is a shimmering example of how plant intelligence translates into exquisite beauty benefits. For instance, it takes the average tree around 60 years to grow to an “adult” size – but it take bamboo only 60 days! Of course it can teach the skin to regenerate and heal when it knows how to regenerate itself so quickly! All in the work of Mother Nature and evolution! We suggest you add the magnificent bamboo exfoliant to soaps, facial cleansers, shower gels and even shampoo. Small amounts of bamboo exfoliant in shampoo can keep hair lustrous and shiny by washing away dead skin cells and buildup from hair strands and by keeping hair ducts clear. So let your consumers enjoy the results!